The MOSD Day School Program offers PRESCHOOL classes for children ages 2 through 6 years. Our year-round school provides ongoing classes and therapies to help the children maintain the skills which have been developed. Preschool classes are offered on a full-time basis five days per week from 8:30 am to 3:00 pm. The children in these classes participate in a conventional Preschool curriculum, with "hands-on" experiences designed to promote the development of social, cognitive, perceptual, motor, and language skills. All children at the school receive the added benefit of individual and group therapy sessions for speech and aural habilitation (listening), to further enhance their development of SPEECH, LANGUAGE, AND LISTENING skills. Parent meetings are arranged during the fall/winter/spring months for parents to attend. 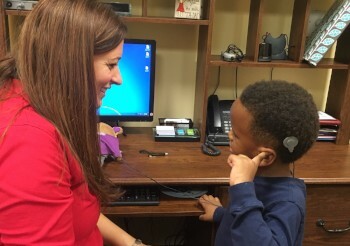 These meetings are designed to provide pertinent information to parents of hearing-impaired children regarding all facets and issues relative to raising their child. Meeting topics are arranged and designed with parent input, and meeting times are scheduled to enable working parents to attend. In our educational meetings, the focus is on information about hearing loss, language development, cochlear implants, and child development. We discuss strategies, techniques, and activities for helping children learn to listen and talk. These meetings are good times for parents to ask questions and share practical ideas for raising a child with a hearing loss. Topics also include areas, which are high-interest for preschool parents in general. These include nutrition, behavior and potty-training just to name a few. These meetings are also a wonderful place to meet other parents of children with hearing loss!